The following is a list of some of the local wineries ( a number of which are highly acclaimed and received awards in James Halliday’s 2019 Wine Companion) which are within a short drive from Lake Fyans Holiday Park. Please contact the winery direct to confirm opening hours as their hours may change. Although we do not recommend one winery over another we can assure you they are all great examples of what Wineries in the Grampians have to offer and are each unique and well worth a visit. 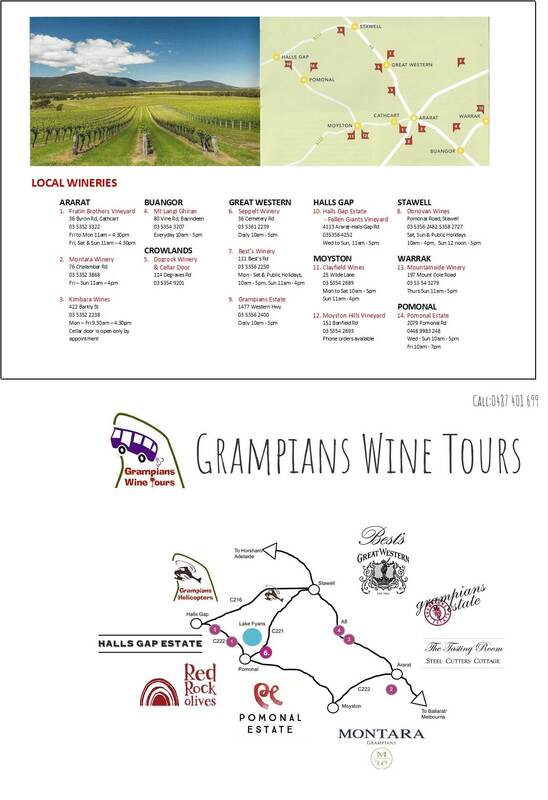 If you enjoy your wine (some of us too much) and don’t want to drive, there is a fantastic service available from Grampians Wine Tours that will offer you an opportunity to visit a selection of these and leave the driving to them. The above images have been sourced from the Ararat Visitor Information Guide and Grampians Wine Tours.